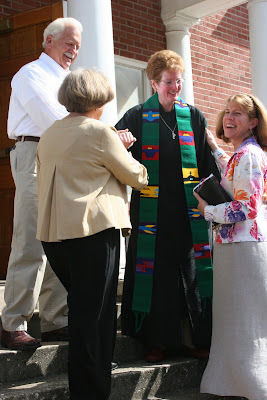 Marshall Presbyterian Church folks are excited to welcome Reverend Melissa Upchurch as their newly installed pastor. Although she has most recently moved from Dallas, Texas, Reverend Upchurch grew up in Fayetteville, Arkansas so she feels at home in the mountains. Pastor Upchurch has a BA in journalism from the University of Arkansas and her Master of Divinity from the Perkins School of Theology at Southern Methodist University. Of her past career as a journalist, Melissa says, "I have discovered much to my delight that the skills I employed in communications work have transferred nicely to ministerial work. I believe I have found the point where my joy in work intersects with a need in the world . . . ."
It was Melissa's concern for the needs of the world which impressed members of the committee selecting Melissa to serve in Marshall, "We were intrigued with Melissa's expressions of very concrete ways that the Gospel of Jesus Christ can make a difference in society, the daily lives of people, and in God's creation, our environment and animals." The Presbyterian Church, PCUSA, has had a long history in Madison County. Between 1893 and 1994 sixteen schools and one hospital were maintained by the mission boards of the Presbyterian Church. 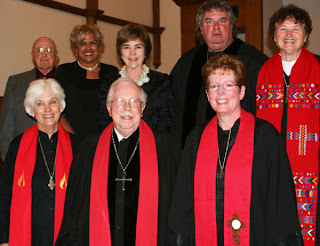 Marshall Presbyterian Church members strive to continue that history and do as Christ commanded, "Feed my sheep." Pastor Melissa has plans for new adult bible studies, confirmation classes for high school youth, and increased fellowship opportunities for all ages. Marshall Presbyterian Church is located at 165 South Main Street in Marshall. The worship service is at 11:00 a.m., Adult Sunday School at 10a.m. People from all backgrounds are welcome. For more information on Marshall Presbyterian Church, please visit marshallpres.org or call 828-649-3662.